ASTA in Guimarães – On 7th and 8th of October, ASTA will present at the NOC NOC festival, in Guimarães, the show “ad murmuratio”, on the Largo da Misericórdia, at 17.00h. 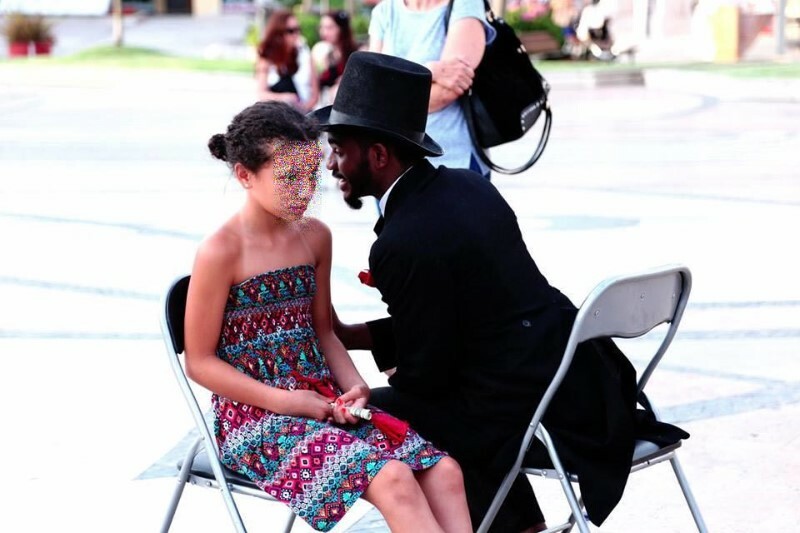 “ad murmuratio” – from Latin, a deaf rumble of many voices – is an urban intervention / installation / performance, built to be presented in the street, in squares or avenues, belvederes, gardens, or inserted in different architectural spaces. It can also be presented inside theaters, emblematic buildings, castles, churches, museums …. “ad murmuratio” tells a poem or a text to the passersby or the public of a festival. It is neither declamation nor recitation. It is an intimate saying in the ear. Almost like a murmur, the immortalized words of the great universal authors are whispered in the ears of the people. “ad murmuratio” recovers the tradition of speaking next to the other, next to the other and to the other. And suddenly, and by chance, passing a street, a square, entering a building, a church … we are challenged by a stranger to sit on a chair to listen and … Feel! “ad murmuratio” is like an endangered ritual! On what occasions do we whisper or whisper to each other?! When we confess, when we want to tell a secret, when we swear in love … In “ad murmuratio” each presentation is unique and individualized, since the relationship established between sender and receiver is unrepeatable, making the show personal, allowing one to reach the most intimate of each. “ad murmuratio” is a project that can be presented in different ways and with different texts. It has been presented in the past in several cities and with various surroundings. In open spaces and in enclosed spaces. As an example, it was presented in Avila, Spain, in front of the Cathedral of Santa Teresa, where the public listened to poems written by Santa Teresa, herself. In Madrid, Spain, at the eñe Festival, which celebrates Spanish lyrics, the whispers were in Calle Huertas, in the heart of the Letras district, where the great names of the Spanish Golden Century resided and there they could appreciate the words of Cervantes, Quevedo, Unamuno or Lorca, among many others. “ad murmuratio” was also presented in Santa Maria da Feira, at the Festival Imaginarius (2015), the ‘biggest’ street theater festival in Portugal, and known threw all europe. The poems offered were from a local poet. In this event “ad murmuratio” won the first prize of the festival. The jury was composed of members of the largest European street theater festivals. Companies of different nationalities (Spain, Argentina, Uruguay, Italy, Australia, Denmark, Reuni Kingdom, Czech Republic, France, Israel and Ireland) competed. The Jury, composed of a group of specialists from national art schools (ESMAE – School of Music and Performing Arts, Porto and DECA – University of Aveiro) and directors of international street festivals (GDIF, Spoffin, the Netherlands and Fira Tàrrega, Spain). 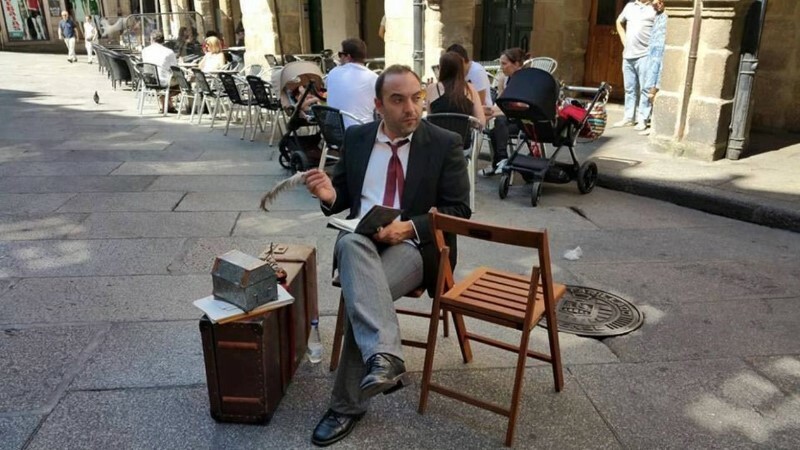 Once again in Spain, this time in the Galician city of Ourense, the presentation was part of the city’s summer festivals (2015) and the poems of the Portuguese poet Florbela Espanca and the Galician poet Chus Pato were chosen. The intervention took place in several arteries of the historical center of that city, with the poems to be said in Portuguese and Galician. Given the versatility of the project, in Covilhã, “ad murmuratio” was transvestite and presented to the public of the city of Covilhã, in the municipal garden, poems of the XV century, from the Covillian D. Rodrigo de Castro. In this presentation the interpreters were dressed as Franciscan friars and the audience was invited to kneel in confessionals from the city’s sacred arts museum, to listen to a poem whispered in archaic Portuguese. This presentation was part of the celebrations of the 600th anniversary of the seizure of Ceuta (August 2015), to which the municipality joined. “ad murmuratio” was also in the south of the country, in the MIAS – Traveling Exhibition of Arts in Silves, in Armação de Pêra, (November 2015) in the Algarve. Here the poems of Florbela Espanca were presented to the public. The intervention took place in a hotel of charm of that locality. In (2016), “ad murmuratio” was on 13 and 14 August at the Medieval Fair of Belmonte, which celebrated Pedro Álvares Cabral. The intervention took place in the church of São Tiago and were whispered passages of Vera Cruz, book of the Covilhã João Morgado, that retract the life of the discoverer. On August 25 (2016), “ad murmuratio” participated in the International Festival of Theater of Setubal – To make the Feast, and told the passers-by poems of Bocage, since this year was celebrated the 250th anniversary of his birth. In November (2016), “ad murmuratio” crosses the Atlantic to participate in the International Festival – Derecho al Arte, in Toluca, capital of the State of Mexico, was made known the poetic work of Florbela Espanca. 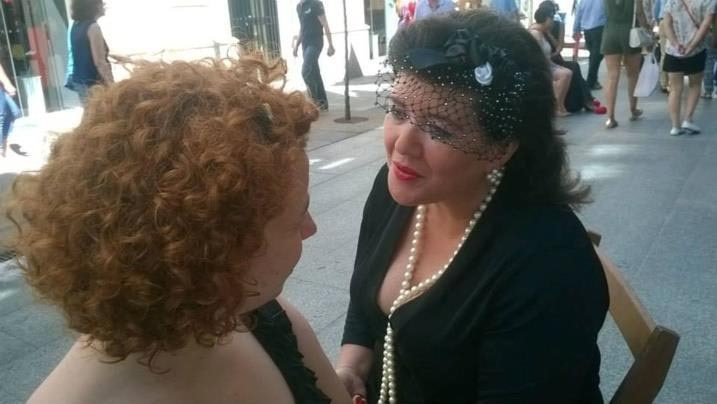 On 23 June (2017), on the streets of Sintra, tourists and residents were once again introduced to the words wrapped in suffering, love and longing for the great poetess Florbela Espanca. The project can be presented in several languages, Portuguese, Galician, Spanish, French and English. It is a simple intervention, without the devices that normally mark the street arts. “ad murmuratio” stands out for this very reason, for its simplicity and delivery of the interpreters, by the communion between the actor and the spectator. 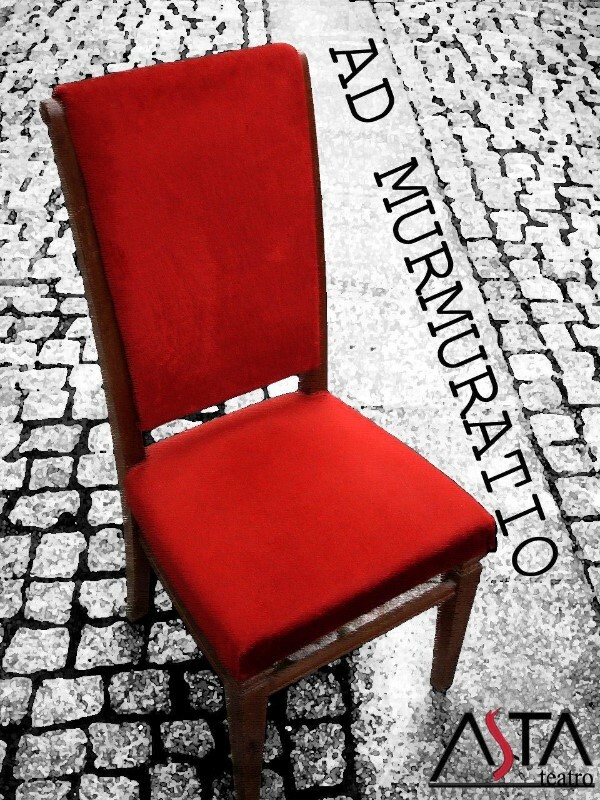 “ad murmuratio” has seven interpreters and has the advantage of having no scenery or structures to carry, everything is reduced to a simple and so significant chair. There will also be no need of scene light, since the aim is to murmuratio to be inserted and adapted to the place of presentation and be the light of that place to illuminate the intervention, be it night or day. ASTA em Guimarães _ Dias 7 e 8 de outubro a ASTA apresenta no NOC NOC, em Guimarães, o espetáculo “ad murmuratio”, no largo da Misericórdia, às 17.00h. “ad murmuratio” – do latim, rumor surdo de muitas vozes – trata-se de uma intervenção/instalação urbana construída para ser apresentada na rua, em praças ou avenidas, miradouros, jardins, inserida em espaços arquitetónicos diferenciados. Pode também ser apresentado dentro de teatros, edifícios emblemáticos, castelos, igrejas, museus…. “ad murmuratio” conta um poema ou um texto aos transeuntes ou ao público de um festival. Não é declamação nem recitação. É um dizer íntimo, ao ouvido. Quase como um murmúrio, são sussurradas aos ouvidos das pessoas as palavras imortalizadas dos grandes autores universais. “ad murmuratio” recupera a tradição de falar próximo do outro, junto do outro e para o outro. E, num repente, e por acaso, ao passar numa rua, numa praça, ao entrar num edifício, numa igreja… somos desafiados por um desconhecido a sentar-nos numa cadeira para escutar e… Sentir! Em “ad murmuratio” cada apresentação é única e individualizada, pois a relação que se estabelece entre emissor e recetor é irrepetível, tornando o espectáculo pessoal, permitindo chegar ao mais íntimo de cada um. “ad murmuratio” é um projeto que pode ser apresentado de distintas formas e com diversos textos. Já foi apresentado no passado em várias cidades e com várias envolvências. Em espaços abertos e em espaços fechados. A título de exemplo foi apresentado em Ávila, Espanha, defronte da Catedral de Santa Teresa, onde o público escutou poemas escritos pela Santa. Em Madrid, Espanha, no Festival eñe, que celebra as letras espanholas, os sussurrantes estavam na calle huertas, em pleno bairro das letras, onde residiram os grandes nomes do siglo de oro espanhol e aí puderam ser apreciadas as palavras de Cervantes, Quevedo, Unamuno ou Lorca, entre muitos outros. “ad murmuratio” foi também apresentado em Santa Maria da Feira, no Festival Imaginarius (2015), o ‘maior’ festival de teatro de rua de Portugal, os poemas oferecidos foram de um poeta local. Neste certame “ad murmuratio” ganhou o primeiro prémio do festival. O júri era composto por membros dos maiores festivais de teatro de rua europeus. Estavam em competição companhias de diversas nacionalidades (Espanha, Argentina, Uruguai, Itália, Austrália, Dinamarca, Reuni Unido, República Checa, França, Israel e Irlanda). O Júri, composto por um conjunto de especialistas de escolas artísticas nacionais (ESMAE – Escola Superior de Música e Artes do Espetáculo, do Porto e DECA – Universidade de Aveiro) e directores de festivais internacionais de rua (GDIF, Reino Unido; Spoffin, Holanda e Fira Tàrrega, Espanha). Novamente a Espanha, desta feita na cidade galega de Ourense, a apresentação esteve inserida nas festas de verão (2015) da cidade e foram escolhidos poemas da poetisa portuguesa Florbela Espanca e da poetisa galega Chus Pato. A intervenção decorreu em várias artérias do centro histórico daquela cidade, com os poemas a serem ditos em português e galego. Dada a versatilidade do projeto, na Covilhã, “ad murmuratio” travestiu-se e apresentou ao público da cidade da Covilhã, no jardim municipal, poemas do século XV, do covilhanense D. Rodrigo de Castro. Nesta apresentação os intérpretes estavam vestidos de frades franciscanos e o público era convidado a ajoelhar-se em confessionários, oriundos do museu de artes sacra da cidade, para escutar um poema sussurrado em português arcaico. Esta apresentação esteve inserida nas comemorações dos 600 anos da tomada de Ceuta (agosto de 2015), a que o município covilhanense se uniu. “ad murmuratio” esteve também no sul do país, na MIAS – Mostra Itinerante de Artes de Silves, em Armação de Pêra, (novembro de 2015) no Algarve. Aqui foram apresentados ao público os poemas de Florbela Espanca. A intervenção decorreu num hotel de charme daquela localidade. Em (2016), “ad murmuratio” esteve nos dias 13 e 14 de agosto na Feira Medieval de Belmonte, que celebrou Pedro Álvares Cabral. A intervenção decorreu na igreja da São Tiago e foram sussurradas passagens de Vera Cruz, livro do covilhanense João Morgado, que retracta a vida do descobridor. A 25 de agosto (2016), “ad murmuratio” participou no Festival Internacional de Teatro de Setúbal – Fazer a Festa, e contou aos transeuntes poemas de Bocage, já que este ano se comemorou o 250º aniversário do seu nascimento. Em novembro (2016), “ad murmuratio” cruza o atlântico para participar no Festival Internacional Com Derecho al Arte, em Toluca, capital do Estado do México, foi dado a conhecer a obra poética de Florbela Espanca. A 23 de junho (2017), nas ruas de Sintra, foram uma vez mais dadas a conhecer, a turistas e moradores, as palavras envoltas em sofrimento, amor e saudade da grande poetisa Florbela Espanca. O projeto pode ser apresentado em vários idiomas, português, galego, espanhol, francês e inglês. Trata-se de uma intervenção simples, sem os artifícios que normalmente marcam as artes de rua. “ad murmuratio” ganha destaque por isso mesmo, pela sua simplicidade e entrega dos intérpretes, pela comunhão entre o actor e o espectador. “ad murmuratio” conta com sete intérpretes e tem ainda a vantagem de não ter cenários ou estruturas a transportar, tudo se reduz a uma simples e tão significativa cadeira. Também não será necessária luz de cena, pois o objetivo é que “ad murmuratio” se insira e adapte ao local de apresentação e seja a luz desse local a iluminar a intervenção, seja noite ou dia.